Your windshield is a key safety feature of your vehicle. It prevents passengers from being discharged, so it needs to hold strong in case of an accident. That’s why it is imperative that a windshield is replaced by a skilled and qualified professional. At My Pro Auto Glass, we offer Windshield Replacement for all vehicle models and years. We install Windshield Replacements every day and are knowledgeable in all varieties of vehicles. With the new additions of ADAS(Advanced driver-assistance systems), it is even more important that you choose the best windshield technician. Especially in modern vehicles, most of these “smart” features are linked to your windshield. And many of these features require some form of recalibration once the new windshield is replaced. We are highly skilled in every aspect of windshield replacement. Because we use high-quality materials, you can feel confident in knowing your new windshield will last and fit perfectly. There are no hidden fees. Once we give you a quote, you can be sure we will not charge you more than that quote. Is your windshield too damaged to drive?? No worries, we can send a technician out to you. We offer a lifetime warranty on all our windshield replacements. Give us a call today to speak with a professional technician and get your free quote. It may be the case that you don’t need a full replacement and it might just be a small repair. We’ll find the best solution to fit your car’s needs and have you back on the road in no time. Call for your free quote now (866) 984-2024. Our friendly techs are ready to answer your questions. You can schedule a time that is convenient for you, and with mobile service, you can have the work done at your home or office. We accept all major credit cards. 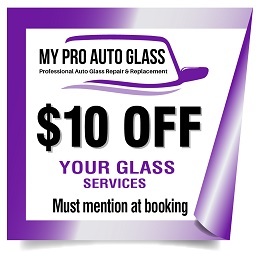 When you're looking for professional auto glass services call My Pro Auto Glass. We work on all makes and model vehicles. If you can't drive your vehicle to us we can come to you at no extra charge. We offer free no obligation quotes over the phone. Services include Windshield Replacement, Auto Glass Repair, Vehicle Door Window Replacement, Back Glass Replacement, Vent Glass Replacement, Truck Glass Replacement, Power Window Motor Replacement and more!